Blaze introduces an affordable commercial style grill that was designed with your outdoor grilling needs in mind. Blaze gas grills feature precision cut, 304 stainless steel components which bring the promise of lasting durability to your outdoor kitchen! Blaze gas grills have a lifetime warranty that warrants against any defects in the manufacturing and workmanship of the main burners, cooking grids, body, flame tamers, heat zone separators, warming rack, and control valves. Watch the performance of the Blaze Gas Grill in live testing. Watch how the bbq grill controls flareups and produces great tasting food. For more information on Blaze Gas Grills for your outdoor kitchen, contact The Woodstove Fireplace & Patio Shop. Make your purchases a breeze using Flexible Financing Options*. Financing gives you the ability to purchase the fireplace that is right for you rather than settling for second-best. With our help, it’s no longer an overwhelming task. A beautiful fireplace makes your house a home. Applying for financing only takes a few minutes and if approved, you’ll be set to go in any of our participating stores! Don't Wait for the Tax Free Holiday, Taking Orders Now! The Massachusetts 2018 Tax Free Holiday has just been announced for Saturday, August 11th and Sunday, August 12th. But you don't have to wait until next month to take advantage, The The Woodstove Fireplace & Patio Shop is taking orders now! This is a perfect time to buy and the perfect time to take advantage of the Massachusetts Woodstove Change Out Program and have a more comfortable (and efficient) winter. You can also double or triple the savings by opting for 12 months interest-free financing and by taking advantage of our Bargain and Burn Pits. Saturday August 11th we are open from 10am to 5pm. Sunday, August 12th, we are opening just for you from 10am to 4pm. For more information on the Tax Free Holiday or the Woodstove Changeout Program, contact us. BOSTON (AP) — Massachusetts shoppers are a step closer to enjoying their first sales tax holiday in three years. The House on Tuesday approved an amendment to an economic development bill that would suspend the state’s 6.25 percent sales tax on the weekend of Aug. 11-12. It also needs approval from the Senate. The Woodstove Fireplace & Patio Shop is taking orders now! This is a good time to buy if you can combine your purchase with the Woodstove Change Out program. Moreover, we have bargain pit and burn pit items on sale which are included in the tax free shopping holiday. Plus, we currently offer up to 12 months interest free financing. So what are you waiting for? Contact Woodstove Fireplace & Patio Shop for more information. By the way, our stores will be open on Sunday, August 12th at 10 am - 4pm. Don't miss this limited time offer. Shop now! Gas Grills Are Just So Easy! Grilling on a holiday like the Fourth of July, when you’ve got the day off, is easy. You can take your time; pull out your artisanal hardwood charcoal; light it in your chimney starter; build a perfect two-level fire; and lovingly tend your rib-eye, or your chicken breasts, or your pork ribs. Fourth of July is hobby grilling. But what about the 22nd of July, or the 12th of August — when temps are in the 80s or 90s and all you want is to be in your backyard with a beer and a hunk of meat to cook? Instead, it’s 6 p.m., you’re at the office, the kids need to eat, and you still have to go to the store. This is why gas grills are so easy. Charcoal purists will tell you their preferred fuel leads to better flavor. Cooking on charcoal has one indisputable advantage over gas: It gets much hotter. Glowing coals are at a temperature of about 2,000 degrees of radiant heat; while gas gets hotter, there’s very little radiant heat from the flames. And radiant heat is what’s really cooking your food on a grill. That’s why gas grills use some sort of surface to create radiation, whether it’s lava rocks or ceramic plates. These surfaces are heated by the gas flame, creating the radiant heat generated naturally by charcoal. Charcoal purists will try and tell you that their preferred fuel leads to better flavor. Your food doesn’t know what’s creating the heat below it, and once charcoal is hot, there aren’t any aromatic compounds left in the coals. Some say: Carbon is carbon; as it burns, it imparts no flavor of its own to the food being grilled. The characteristic flavor of grilled food comes from the drippings, not the fuel. When those drippings hit the heat source, the oils, sugars, and proteins burst into smoke and flame. That “flavor” rises in the smoke and warm air to coat the food you’re grilling. Still not convinced? Know what’s worse than grilling on charcoal? Not having time to grill at all. You can walk in with a bag of groceries at 6:30, and have grilled chicken on the table at 7, a happy family praising a delicious dinner. The most precious commodity in the world, that’s constantly dwindling, is time. A gas grill claws back time for you every time you use it. Grill three times a week over the course of a summer, and you’ll have saved yourself a full day. A day! Think of what you can do with an extra day, provided to you by your gas grill. For information on gas grills, contact The Woodstove Fireplace & Patio Shop. The Primo keg-style ceramic grills are designed to fit everyone's outdoor cooking needs. From the Oval XL 400 to the classic round Kamado. Every Primo grill is made to be a primary outdoor cooker, but any of them can be added to a built-in outdoor kitchen or to complement an existing grill or smoker. To give you an idea of the size of our grills and cooking area, we've rated them based on the number of steaks that can be grilled at one time. For more information on Primo charcoal grills, contact the Woodstove Fireplace & Patio Shop. June 30th through July 9th. Reopening on July 10th. Setting the standard for creative innovations in outdoor cooking equipment is what Alfresco has become known for. This Pizza oven is an exciting new outdoor pizza and culinary oven engineered to commercial performance caliber. With a preheat time of only 15 minutes, this pizza oven is not only great for cooking pizza, but also is fabulous for baking, broiling, roasting, and just about anything else you can do in a regular oven. However, it’s faster and with much better results! Whether you’re cooking 3-minute Neapolitan pizzas directly on the hearth, thick prime New York steaks pan seared in an iron skillet, herb & spice rubbed pork chops in a ceramic baking dish, skillet-sizzling shellfish, or zesty jalapeno corn bread in a ramekin, it can all be done in Alfresco’s new Pizza. There’s simply no pizza oven like it…period! And right now there is a $500 cash-back rebate. Memorial Day was the unofficial start of summer and the true beginning of grill season. If you are in the market for a new gas grill, there are a few questions you should ask yourself before you buy. How often do you grill? How many people will you grill for most often? How long do I want the grill to last? Once you answer these questions, you will know in what price range you need to shop. Here are a few of the benefits of gas grills. You may have one in your backyard, but now is the time to upgrade to a gas grill that can transform backyard grilling into an experience. Gas grills are generally known as a higher end grill than a charcoal. They last longer, have loads of amenities and come in various sizes, from two to four burners. The main advantage of a gas grill is the convenience. Gas grills have gained popularity because they're ready to cook on in less than 10 minutes. The temperature of gas grills is also very easy to maintain. And the more burners a grill has, the more cooking flexibility you'll enjoy. For more information on every style gas grill, contact the Woodstove Fireplace & Patio Shop. 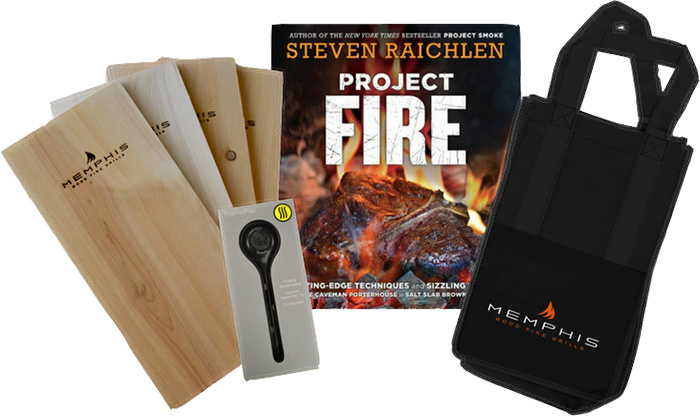 Summer is here and so is another exciting Memphis Wood Fire Grills promotion! As you may know, our promotions have proven to be very popular in the past. We’re particularly excited for this season’s Free Summer Grilling Kit promotion. Promotional forms are in the mail on their way to dealers across the nation. All you have to do is inform customers of the promotion and place your forms on the grills or in a visible location. Once customers send us a filled-in form and a copy of their receipt, the Memphis team will process the orders and send the kits directly to the customers. Learn more about the summer promotion and download the Free Summer Grilling Kit form.